Kiya was a lesser ranked wife of Akhenaten, often known as 'The Favourite' and also 'Greatly Beloved Wife' - there were many representations of her at Amarna, where she is thought to have held considerable power. 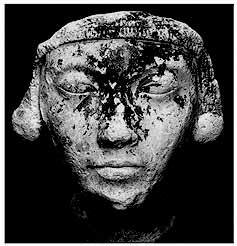 Kiya is thought to have been a foreign princess, known originally as Tadukhipa sent from Mitanni to be married to Amenhotep III. Kiya died before Akhenaten and was buried with considerable funerary treasure, although her body and her children (she may have had a daughter and possibly two sons) have not been found. 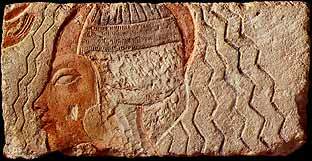 Since her name has been discovered Kiya has remained very mysterious - her title of 'Greatly Beloved Wife' indicate that she obviously held some power at Amarna, but how much? In a few reliefs at Amarna Kiya is shown in the company of a daughter, and some scholars have argued about her giving birth to two sons as well. Many scholars think that Kiya was the mother of Tutankhamun (see later note) - which was the main reason for her favoured status and her titles. All indication are that Kiya was in favour before Year 9 or 10 of Akhenaten's reign, but after Year 11 (about the same time as Tutankhamun's birth) - she dissappears from view. She fell out of favour with the royal regime (many of her monuments found at Amarna had been re-dedicated to Meritaten). It is thought that Kiya was originally a Mitannian princess, Tadukhipa, originally sent to be a wife of Amenophis III - but on arrival was instead married to Akhenaten. Fortunately, enough funerary equipment belonging to Kiya has survived to show that it was of incredible workmanship and also that it was made before Year 9 of Akhenaten's reign. It has been suggested that Kiya could have originally been buried in chamber alpha in the royal tomb at Amarna - but this does remain very uncertain owing to the way in which the tomb was plundered and damaged in antiquity. Despite the intimate scenes of Akhenaten and Nefertiti with their children suggesting a very close family relationship, a relief in the tomb of Ay at Amarna suggests that Akhenaten did have other secondary wives apart from Kiya, there is another name - Ipy 'a Royal Ornament','A True Favourite of the King'. But Kiya was certainly the most important of these 'second' wives, apart from her funerary furniture she also had a sunshade temple in the Maru-aten and chapels for her cult near the entrance to the Great Temple at Akhetaten. A number of scenes from Hermopolis, unfortunately heavily damaged, do show Kiya worshipping before the Aten - but using the spelling of the Aten it is possible to date these inscriptions to the later stages of Akhenaten's reign. 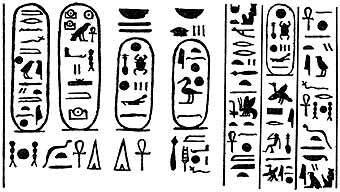 Furthermore there is no mention of either Nefertiti nor Meketaten and so these inscriptions must be older than Year 14 or later. Meritatena and Ankhesenpaaten do feature - and feature more heavily than that of Kiya which shows their more important status. But Kiya is shown followed by an infant, most likely her daughter. The inscriptions that belonged to Kiya in the Maru-aten had been re-carved during the time of Akhenaten to that of Meritaten, Kiya's features had also been re-carved to resemble Meritaten's features also. (Originally this re-carving was thought to be the proof that Nefertiti had come to disgrace and that it was her name that had been recarved). It is thought most unlikely that the inscriptions and reliefs were re-carved while Kiya was still alive - unless she had fallen into deep disgrace (of which no evidence exists). Indeed the name 'Kiya' seems to exist into Year 16, it must be that about this time she did die and then the inscriptions were changed at the Maruaten. If Akhenaten was the father of Tutankhamun (and possibly Smenkhkare also) then the Kiya remains the most probable choice of mother. As stated above it is thought that Kiya did have a daughter by Akhenaten and possibly one or two sons, if she did give Akhenaten a son then this could explain her titles of 'the favourite' and 'Greatly Beloved Wife'. Scholars have also looked to the Funeral scene in the Royal Tomb at Amarna, this does show a woman holding a baby in her arms being shielded by the sun by a fan - which does indicate a royal personage - it is still a matter of contention as to whether the woman and child is Kiya and a very young Tutankhamun or a nurse and the baby of Maketaten. 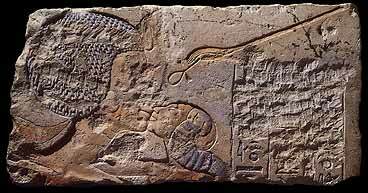 (See the section on the Royal Tomb at Amarna to further explore this scene). However, there is no mention in the tomb of Tutankhamun of Kiya - which of course could mean that she was not the mother...... or it could mean that being a wife of the heretic king all such mention of her was removed from Tutankhamun's history. Much of Kiya's funerary equipment has survived through being re-used in KV55, the sarcophagus that held the mummy found there was originally made for Kiya as were the Canopic Jars that were the representations of her face.